A top secret surveillance satellite and 12 tiny co-passengers are ready for launch from California's hilly coastline late Thursday aboard an Atlas 5 rocket. The United Launch Alliance booster is set for liftoff at 11:13 p.m. PST (0713 GMT; 2:13 a.m. EST Friday) from Space Launch Complex 3-East at Vandenberg Air Force Base, Calif. The Atlas 5 rocket's primary payload is classified. Its owner, the U.S. government's National Reconnaissance Office, has not divulged its identity or purpose. But a warning released to keep pilots out of the rocket's flight path shows the Atlas 5 will fly southwest from California, heading for a unique retrograde orbit traveling the opposite direction of Earth's rotation. Only a handful of launches have gone in that direction from Vandenberg, and experts believe they carried new-generation satellites equipped with radar imaging payloads to track the movements and activities of intelligence targets without hindrance from clouds or darkness, which prevent optical cameras from getting pictures. The Atlas 5 launching Thursday night is configured with a five-meter diameter payload shroud built by RUAG Space in Switzerland, no solid rocket boosters and a Centaur upper stage with a single hydrogen-fueled RL10 engine supplied by Aerojet Rocketdyne. That version of the workhorse rocket is known as the "501" variant. ULA can put a four-meter or five-meter fairing on the Atlas 5, install a second upper stage engine, and add up to five strap-on boosters depending on the needs of its payload. 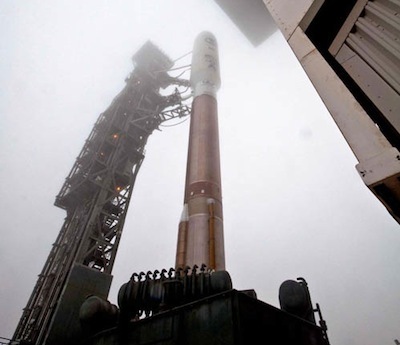 The Atlas 5's bronze first stage, powered by a an RD-180 engine built in Russia, will fire for more than four minutes. During the first stage burn, the rocket will jettison its nose fairing in two halves, followed five seconds later by the release of a component called the forward load reactor, which affixed the fairing to the Centaur upper stage. With that milestone, the launch will go into a news blackout at the request of the NRO, which is banning the release of information on the progress of the Centaur second stage's engine firings. ULA and the National Reconnaissance Office plan to issue press releases once the mission is complete. After deployment of the primary satellite, the Centaur will release 12 small CubeSat secondary payloads sponsored by the NRO's Mission Integration Directorate and NASA's Educational Launch of Nanosatellites, or ELaNa, program. 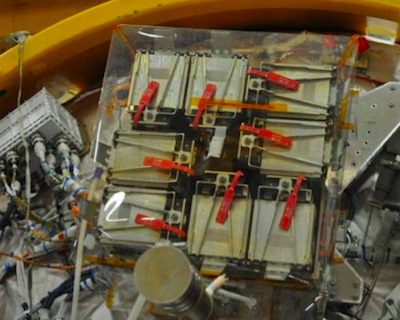 Once in orbit, the CubeSats will pop out of eight "P-POD" deployers housed inside a Naval Postgraduate School CubeSat Launcher system, which is mounted on the aft bulkhead of the Centaur upper stage. The NRO calls the collection of secondary payloads GEMSat, standing for Government Experimental Multi-Satellite. "The GEMSat rideshare on NROL-39 represents a significant milestone in accomplishing consistent access to space for advancing novel capabilities in support of the NRO and the intelligence and Department of Defense communities," said Major David Illsley, chief of the NRO CubeSat program office. "Lack of dependable launch opportunities within the United States, have formerly imposed a bottleneck on the rate of advancement for small satellite technologies and associated capabilities," said Illsley. "Some payloads on GEMSat will demonstrate second generation payload technologies. This high development and demonstration tempo allows for rapid transition from innovation to operations of novel overhead solutions." AeroCube 5, a mission for the Aerospace Corp. to demonstrate new technologies for pointing and tracking between two CubeSats. AeroCube 5 will also record launch environment data such as pressure, temperature and vibration, as well as demonstrate a de-orbit device. ALICE, developed by the Air Force Institute of Technology, will test the performance of an advanced carbon nanotube array, which has great potential for smaller, lighter, and more energy-efficient satellite propulsion. Four satellites for the U.S. Army Space and Missile Defense Command -- SNaP, TacSat 6 and two SMDC-ONE -- will test advanced nanosatellite communications technologies. CUNYSAT 1, developed by Medgar Evans College at the City University of New York, serves as an educational tool for students and will observe Earth's ionosphere. IPEX, or the Intelligent Payload Experiment, was provided by NASA's Jet Propulsion Laboratory and Cal Poly. Carrying several low-resolution cameras, IPEX will validate several technologies for future NASA Earth observation missions, including autonomous on-board data processing, direct downlink operations, and automated ground operations. MCubed 2, developed by the University of Michigan, will demonstrate an advanced real-time high-data-rate instrument processing system for next-generation remote sensing missions. MCubed 2 is a reflight of a previous CubeSat which unintentionally became attached to another CubeSat, preventing it from transmitting data. FIREBIRD 1A and 1B, built by Montana State University's Space Science and Engineering Laboratory, will study microbursts in the outer Van Allen radiation belt. The two CubeSats were funded by the National Science Foundation.